The atomic bomb and meltdowns like Fukushima have made nuclear power synonymous with global disaster. But what if we’ve got nuclear power wrong? An audience favorite at the Sundance Film Festival, PANDORA’S PROMISE asks whether the one technology we fear most could save our planet from a climate catastrophe, while providing the energy needed to lift billions of people in the developing world out of poverty. In his controversial new film, Stone tells the intensely personal stories of environmentalists and energy experts who have undergone a radical conversion from being fiercely anti to strongly pro-nuclear energy, risking their careers and reputations in the process. Stone exposes this controversy within the environmental movement head-on with stories of defection by heavy weights including Stewart Brand, Richard Rhodes, Gwyneth Cravens, Mark Lynas and Michael Shellenberger. 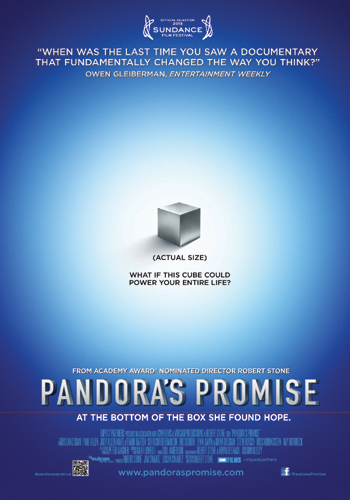 Undaunted and fearlessly independent, PANDORA’S PROMISE is a landmark work that is forever changing the conversation about the myths and science behind this deeply emotional and polarizing issue.